Cup Washer – We are Cup Washer manufacturer in Mumbai. We are wholesaler ofCup Washer. 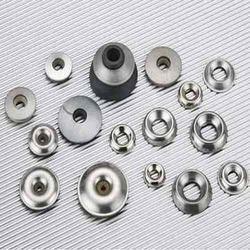 We manufacturer all type of Cup Washer in India and also supplier it all over India. We made Cup Washer from standard quality of material. We offer a wide range of electrical components including electrical plug electrical socket and electrical pin. We, Hi-Tech Engineering Works, Mumbai incepted in 1990, are known as one of the market leaders for the manufacturing and supply of a quality range of Industrial Products and Accessories. The range of products offered by us is inclusive of Oil Lubricators, Sheet Metal Component, SS Film Hanger & SS Tank and Automat Turning Component. The products, offered by us in the market, are widely used in a number of factories. Owing to the best quality raw materials used in their making, the extraordinarily long functional life of our products is highly praised. The credit for our success is owed to our team of skilled professionals and our unmatched infrastructure. We manufacture the offered systems and equipment by making use of optimum quality raw material, procured from the most authentic vendors of the industry. So as to ensure these comply with globally laid quality norms. Further, post production, we make the offered systems and equipment pass a quality test to ensure these are fit to find application in automobile, engineering, cement & steel industries and oil & chemical refinery. The demand of offered systems and equipment are high as these are durable, have precise design, sturdy in construction, are easy to maintain & use and ensure reliable performance.